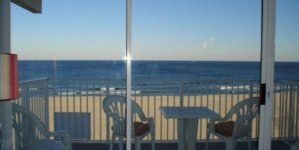 Whether you’re planning a vacation with your family or a large group of friends, or you just relish in the peace and privacy that houses and condos afford, vacation rentals in Ocean City are the way to go. If you’re lucky enough you can spend the entire summer in a rented condo, or just come for a week or two. Either way, vacation rentals provide you the space and privacy (and sometimes even swimming pool!) you need for a stress-free and fun summer vacay. 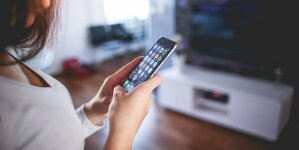 There you can search by date, number of nights, number of bedrooms, price and location, so you’re almost guaranteed to find a rental that fits your needs and your budget. Here are just five awesome options that you’ll find in our directory of vacation rentals. The Steger Apartments are a great choice if you’re looking to rent something out for the entire summer (if not, you’ll have to look elsewhere). 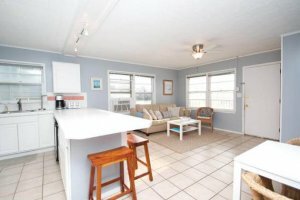 Located on Dorchester St., this condo puts you at the heart of Ocean City and includes space to park, which gives you the best of both worlds: you can take your car out for a day-trip or drive to work, and pretty much everywhere downtown is a short walk or bike ride away. Immaculately clean two bedroom apartments located at 201 Dorchester Street, near OCPD Boardwalk Sub-Station and OCBP. Each unit sleeps five people with brand new primarily separate twin beds (two units have 3 twin beds and one bunk bed). The full size kitchen includes fridge, stove, dishes, pots, pans, utensils, microwave, coffee maker, toaster, electric can opener, etc. The air conditioned building has six units, each with its own deck and two assigned parking spaces (one behind the other). There is also an additional outside hot and cold shower for sand removal. All utilities provided including WiFi. No smoking, parties, or pets. All male or all female in each unit. May 1 to September 3. Price is $2,250 per person, with five people per unit, plus refundable security and key deposit. You can enjoy the million dollar view from the pool. The Million Dollar View provides just that. 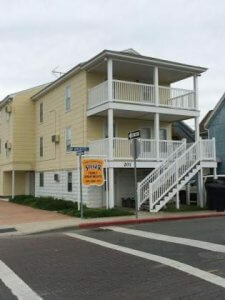 Located on the bay in West Ocean City, this rental is spacious, with four bedrooms and 2.5 bathrooms, and also near all the action in West OC, just a walk away from restaurants, mini golf, go-karts, jet ski rentals and more. The name of this property says it all – a home with a view worth a million dollars! We invite you to stay at this fabulous Bay Front home in West Ocean City. With stunning views across the bay of the Ocean City skyline, it features a private pool overlooking the water, a pool house with a full bath and an outdoor hot tub. In addition, it also boasts a screened porch, huge back yard with swing set, and a private dock for fishing or crabbing! If you’re bringing your boat along, Thunder Island is a bayfront condo with its own boat slip, as well as a large balcony where you can watch other boats come and go from the public boat ramp on 64th street. 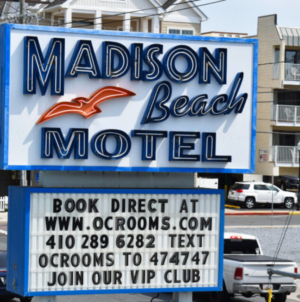 Enjoy modern furnishings, pool access and being right next to Ocean City’s Convention Center. 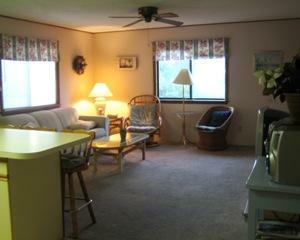 Beautiful 2br/2ba direct bay front with pool and boat slip. Enjoy great bayside water views from your extra large balcony as well as from your living room, dining room, and kitchen. Master bedroom has a private bath and queen bed. Second bedroom has two twin beds. Nice bayside pool. *Boat slips are available from dock master. Public boat ramp at 64th street for launching. Great mid town location right next to convention center close to amusements, restaurants, and nite-life. 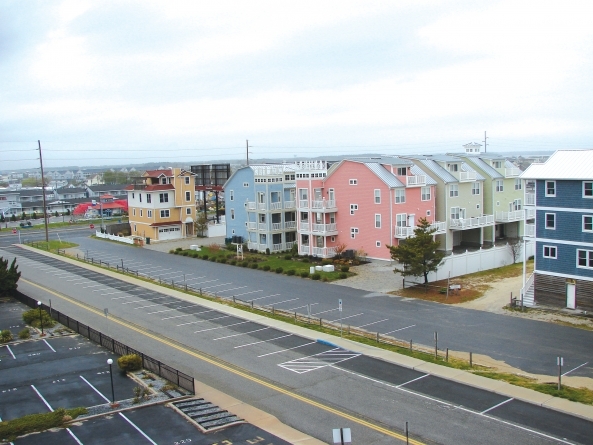 Our Winds can be reserved for weeks, “mini-weeks” and weekends, and is a great choice if you’re looking to stay in Ocean City’s quieter north end. The interior of this condo is spacious, light and beachy, there are balconies in the front and the back, and the beach is just steps away. Northside Park is also walk-able, just in case you want to take a sunset stroll along Ocean City’s bayside. Our lovely, clean, two bedroom, two-bathroom vacation rental comes complete with front and back balcony porches and is set in a cozy wood frame building. Amongst its many features are the spacious, open kitchen equipped with gas stove, all appliances, large breakfast nook (perfect for brunch! ), tiled floor, washer/dryer, bright, sun-filled living room ideal for lounging with a pull-out, full size sofa bed, spacious master bedroom with a full size bed and master bathroom equipped with a glass sliding door shower, porch access from the master bedroom, spacious second bedroom with a full size bed & so much more! This gorgeous beach condo is in a perfect location with the beach literally around the corner! Its conveniently located steps away from all the attractions and shops such as the beach, bay, North Side Park, jogging path, grocery store, restaurants, bakery, shopping and much more. Everything is accessible by a quick, short walk. 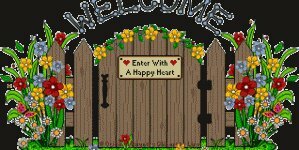 It’s a wonderful place to relax, for families and professionals alike. Sometimes you want to swim in the salty seawater, but other times you want to lounge by the pool. That’s do-able at Lost Colony, a condo in North Ocean City that comes with swimming pool access and is just a short walk from the beach. Plus you’re close to the Maryland-Delaware border, which means tax-free shopping is just minutes away. 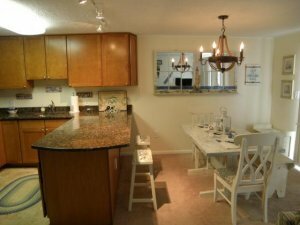 This fully furnished beautiful two bedroom, two bathroom vacation condo is located on 146th Street and has everything you could ever want out of a vacation! Its lovely features include: standard full kitchen equipped with all kitchen appliances, hardwood floors, large breakfast bar with stools included, central AC, washer and dryer, cable TV, VCR, DVD player, stereo, a small video library, DSL/Wi-Fi connection, cozy living room with a pull-out full size sofa bed, master bedroom with a full size bed and lovely master bath, second room equipped with 2 twin beds, bright sun- filled rooms and plenty of parking. 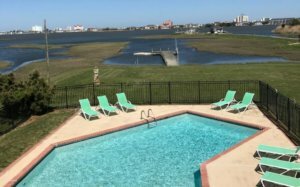 It’s within walking distance of restaurants, bars, mini-golf, water park, go-carts, the beach, a movie theater, shopping, tax-free shopping outlet in Delaware, the boardwalk, bike/moped rentals, bowling, surfing lessons, water sport rentals (i.e. boats, jet skis, etc.) and loads more! This unit sleeps six and is great for families and responsible professionals alike. This article was updated on 4/16/19. 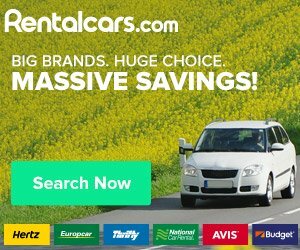 Weekly vacation rentals in Ocean City: When is the best time to book? When is the best time to book your weekly vacation rental for this summer?